There's a couple of things about this comic that are out of date. First, Mr. 103, the man who can turn into any element, is 15 elements behind. It's kind of a cool reminder of how much of the science that we sort of take for granted is really not that old. The Theory of Relativity is barely 100 years old, yet we've assimilated it so fully into the collective consciousness that we walk around wearing t-shirts bearing the fabled "e=mc2." But that's not all! Today's issue also marks the beginning of a Negative Man origin series. Two things leap out at me. 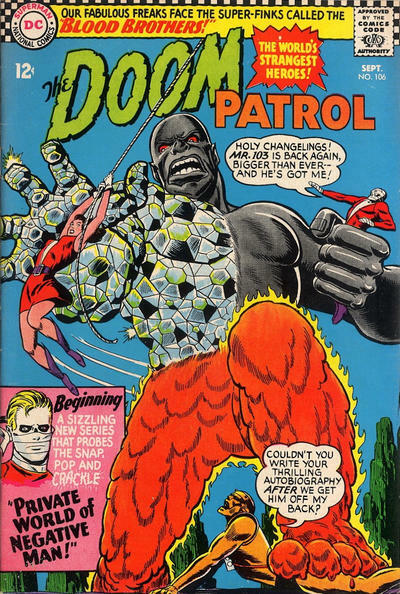 The first, in correlation with Mr. 103's lagging behind the times, begins thus: "You are moving backward in time - - back to one year before The Doom Patrol was formed! No man-made satellite has yet been orbited about Earth! The cold, empty reaches of space are still an unlocked mystery!" I want to say that there's something to the idea that these characters have existed through so many technological and social revolutions, something that adds to their mythic, or iconic, status. But I'll have a think about that later. The second thing I'd like to share is the ridiculously, beautifully hyperbolic intro Larry is given: "In all the annals of comicdom, from the birth of the king - Superman - to the countless fantabulous, funtastic characters of today, none equalis in the thrilling scope for sheer human drama the snap-crackle-pop kid himself --- Negative Man! And here, in all its pulse-pounding action and heart-clutching emotion is the story of its origin, the first chapter of...The Private World of Negative Man."